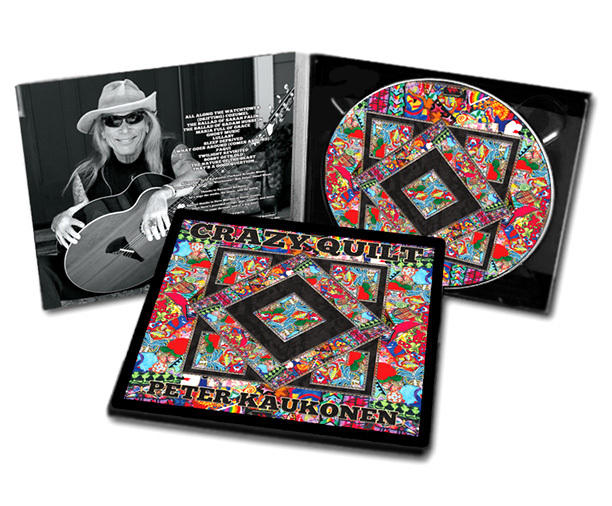 Years in the making, “Crazy Quilt” is yet another eclectic offering from someone who persists on playing unpopular music, but plays the living doo-doo out of his instruments while doing so ..... Yes, this wild collection of music plumbs the depths of the human heart, if the plumber’s friend were a chainsaw! It’s an emotional rollercoaster ride that’ll thrum your heartstrings while you do the funky hand jive! You’ll dance like a chicken in your kitchen! You’ll laugh! You’ll cry! You’ll spend $18.00 and not regret a penny! The order price of $18.00 includes $3 postage and handling and an inscription or dedication of your choice! “Crazy Quilt” is a collection of music I’ve recorded over the last few years, and it includes two brand new compositions. All songs are originals. It’s heavy on acoustic instruments—six and twelve string and baritone guitars; mandolin, requinta, and kantele; acoustic bass, viola, and percussion, along with keyboards and harmonies and ghosts, and the sounds of a coyote pack savaging a neighbor’s poodle underneath a fingernail moon. * There are sociopolitical and historical finger-poppin’ polemics to remind us of things we’d too gladly forget; there are songs inspired by or about children; there are new arrangements of “That’s a Good Question” and “Paqui,” two of my all-time favorite songs; “Bobby Gets Old” and “Twilight Revisited” are songs about life after youth, and there’s “The Nature Of The Beast,” which is a brand new piece that I think of as “sparkling and glittery albeit unpopular,” but damn, it’s good! I’d go on and on and on, but there are extensive liner notes, and I’ll be posting anecdotes about the songs on this website as time and sales go on. Now: go to the purchase button and pony up! *No; I’m just kidding about the coyotes and the poodle. But it’d be a great bonus track!